There are a few things to note when making PHP changes. If you're unfamiliar with this tool, check the notes at the bottom of this article. This guide is for our Web Hosting and Reseller plans, as well as VPS and Dedicated Servers with CloudLinux. If you're on a Blaze / Control Panel VPS, click here for a guide on changing PHP settings. 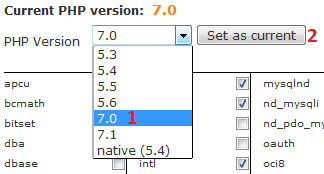 To change the PHP version: (1) Select a version other than native then (2) click Set as current. You will need to do this before you change other PHP settings and modules. 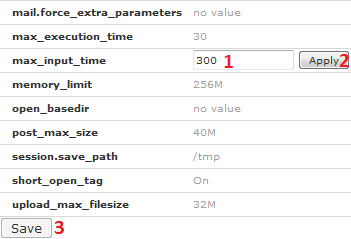 To change the PHP options such as max_input_time, post_max_size etc: First, click on the Switch to PHP Options link in the top right. Note 1: If you had a module or other setting enabled for a different PHP version, you will have to select the modules and enable them again as each version maintains its own list of active modules and other settings. Note 2: Make sure to update PHP one version at a time. Newer PHP versions remove old functions which can break your site, so you will need to go back. Start by updating, for example, from 5.4 to 5.5. Go to your site, test all the pages, forms and functions to make sure everything works correctly. If it's fine, go to 7.1 and test the site again. You can always go back to an earlier version of PHP so there's no serious risk in switching versions.